This week's episode for TCP is Supernatural... So I pick X-Men Movie... 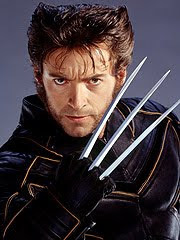 There's only one character that I really love-it's WOLVERINE played by Hugh Jackman... Isn't his role portrayal amazing? if you happened to watch the first 3 volumes of the Uncanny X-Men movie, you better not miss this one! Here's a sypnosis of the movie... This episode focus much on Logan (Wolverine)... happy viewing! oOops! Parental guidance is highly encouraged!